I applied for the following 3 cards, the Barclay US Airways, the Chase Sapphire Preferred, and the Citi American Airlines card, while my wife applied for the Barclay US Airways card, the Chase Ink Bold, and the Citi American Airlines card. Now I should mention that I did not apply for all three of my cards on the same day, which was my first mistake. I applied for the US Airways card and the American Airlines card two days after applying for the Chase Sapphire Preferred. When I applied for the Chase Sapphire Preferred card I was instantly approved, however at this time I was not planning on churning, so I stopped with one application. The next two days I continued researching about credit card churning and I was convinced that my wife and I were going to do our first churn that day. I knew I shouldn’t apply for cards a few days apart, but I did it anyway because I was too excited. Jenni and I finished all 5 of the credit card applications and clicked submit on them. 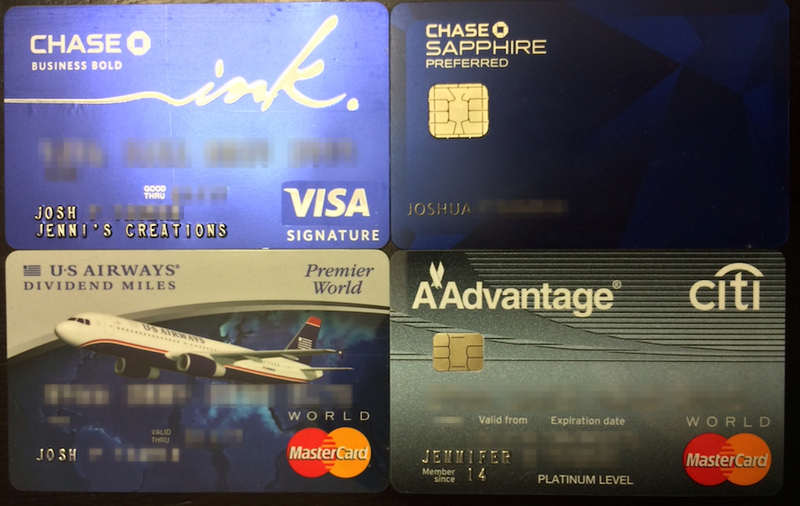 The only card that was instantly approved was Jenni’s US Airways card, but the other four all required review. That was extremely disappointing for us to see! Fortunately, Citi had an online chat pop up on both of our applications immediately. They asked us to verify a few answers on our application and we were both approved within a few minutes. Next up, was to call Barclay and Chase. I called Barclay, while Jenni called Chase. I talked with Barclay for a while and was ultimately denied the card due to “To many recent credit inquiries”. When Jenni called Chase, all she had to verify was her name and her social security number, then she was approved. All of the cards we applied for are personal cards, except for the Ink Bold. You may be wondering how Jenni applied for a business card when we do not have a business. It’s simple, if you sell on eBay, Craigslist, Etsy, or have the intention of selling on one of these sites, then you are making “business” transactions. Jenni happens to be starting an Etsy store, so we decided to apply for the Ink Bold because of that. On the actual application, it will ask what your business name, tax ID number, annual profits, ect. You do not want to lie on the application, because they will likely double-check the information. For the tax ID, you simply need to put your social security number. If you haven’t started the business yet, then for your annual profits you simply put $0, which is what we did. This may sound complicated, but it’s pretty much the same as applying for a personal card. Business cards simply open a whole new avenue for manufactured spending, in fact they often have the best sign on bonuses! Chase Ink Bold: 50,000 Ultimate Rewards Points after $5,000 dollars spent. Chase Sapphire Preferred: 40,000 Ultimate Rewards Points after $3,000 dollars spent and 5,000 Ultimate Rewards Points after adding an authorized user. Barclay US Airways: 30,000 US Airways miles after first purchase and 10,000 US Airways miles towards preferred status after $25,000 spent. Citi American Airlines: 30,000 American Airlines miles after $1,000 spent. That may sounds like a lot of money to spend just to get the sign on bonuses, however using manufactured spending methods and Bluebird, I was able to get all the sign on bonuses, besides Barclay’s $25,000 spend bonus, in two weeks. These cards are still useful to me even after the sign on bonus, because they have very good rewards percentages at certain stores. The Chase Ink Bold offers us 5% back in UR points on office supply stores and utilities, which is a great way to earn more points for every day spending! The Sapphire Preferred offers us 2% back in UR points on travel and dining and the Barclay card gives us a bonus 10,000 miles towards preferred status after $25,000 dollars spent. That makes these cards extremely useful! The only issue I have with them is that they all have annual fees that were waved the first year. I don’t like annual fees, so I will be calling the card issuers after 11 months of owning the card to see if I can get the fee waved, get some sort of bonus offer for keeping the card, or if I have to cancel the card to avoid paying the fees. I would hate to cancel them, but I can really only justify paying the annual fee for the Chase Ink Bold, since it has 5% back in UR points at office supply stores (they sell gift cards :). Stay organized, I can not stress that enough. If you miss a payment, or don’t pay the card off in full you are going to have a bad time manufacturing. Make sure you have found the best credit cards to sign up for. If you don’t know, try to make a plan about what destination you are trying to reach and what airlines fly out of your local airport. If you don’t care what cards you get, get the ones with the highest sign on bonuses. They give you the biggest head start on your points. Start with 3 or 4 cards per churn to test the waters. Don’t overdo it and end up not meeting the minimum spend on a card. You will be missing out on a lot of free points! Make sure to sign up for the cards at the same time. Don’t make the same mistake I did and sign up a few days apart. If you sign up for all the cards at the same time, the hard inquiries won’t be on your account yet, so your score will be slightly higher. Don’t get the sign on bonus and immediately cancel your card, even if it has an annual fee. Many banks watch for this and will take your points away if they catch you. My suggestion is to stick with the card for 11 months, call to have the annual fee waved and if they won’t do it, cancel the card. That way you won’t have to pay the annual fee and you get to keep the points, as long as you transferred them to an airline or have another card that can use those points. Wait a minimum of 90 days between churns. You want the points taken off from your hard inquiries to bounce back. If you are making a large purchase or will need a loan within a year or two, don’t start churning. You will want the best credit score possible when getting a loan, so there is no point in ruining it even if it is only a few points. My first credit card churn had some hiccups, there is no doubt about that, but it was a great learning experience. Now, I know what to do and what not to do next I do a churn. This game definitely revolves around trial and error. I hope my first churn helps you to not make the same mistakes as I did. If you have any questions, leave a comment.